Last month was the annual Teachers for Social Justice Curriculum Fair, and it’s a really fun event. Educators come from around the city to share their innovative curriculum, attend workshops, and eat some delicious Mexican food. I love this event because all of our education allies attend. 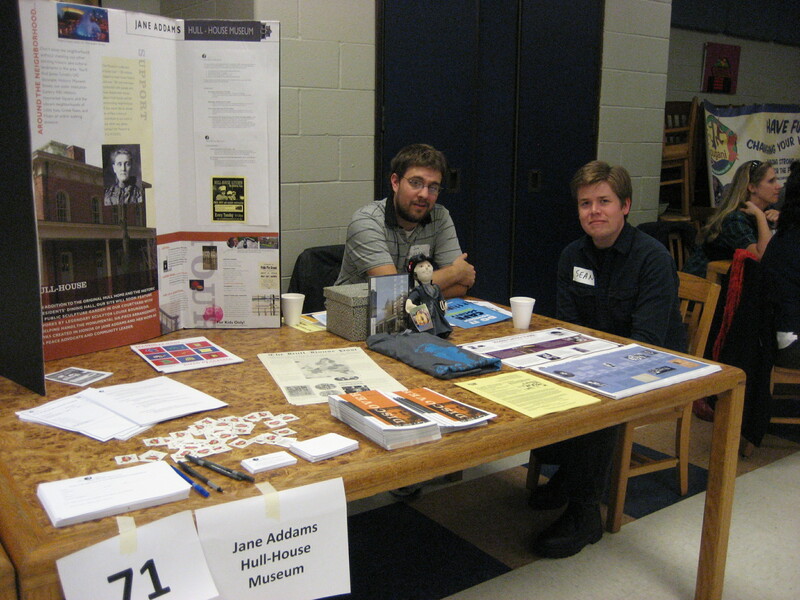 This year Joe and Sean, two of our museum educators, worked at the museum table to tell visitors about what the museum offers to visitors and classrooms. When I asked Joe and Sean to write a blog post about the day, they decided to write a haiku. What creative educators. Thanks guys! You may not know it, but today is Jane Addams Day, an Illinois commemorative holiday and the only one named for a woman. 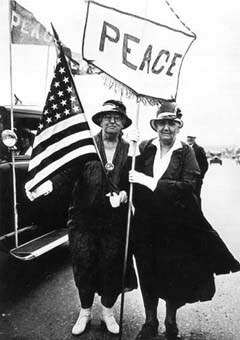 On Jane Addams Day, we celebrate Jane Addams for being America’s first woman to win the Nobel Peace Prize. Jane Addams Day is celebrated thanks to two years of petitioning by Dongola Junior High School students and their teacher, Cindy Vines. The students traveled to Springfield to rally for the proposed holiday, eventually gaining the support of state representatives and then Lieutenant Governor, Pat Quinn. The following poem, written by Kevin Coval, was commissioned on the inaugural Jane Addams Day in 2006. You can listen to Kevin reading this poem here. Tune in to Chicago Amplified to hear a recording of Josh Viertel’s recent presentation at our Re-thinking Soup program! Joshua Viertel, the first President of Slow Food USA, opened this Town Hall discussion by speaking about Slow Food USA’s vision for the U.S. about critical issues of access and equity regarding healthy food, nutrition, and well-being. The Hull-House Museum invited food activists, farmers, environmentalists, and anyone interested in these issues to come share their ideas and opinions. Joshua Viertel has made significant contributions to the sustainable food movement in the past as a teacher, farmer, and activist, and, for the past 6 years, as a co-founder and co-director of the Yale Sustainable Food Project. At Yale, Viertel oversaw the University’s transition to a local sustainable food program, created and managed an organic farm on campus, and built educational and academic programming around food and agriculture. Under his leadership, the Yale Sustainable Food Project has earned a reputation as a leader in the national and international sustainable food movement. Viertel graduated from Harvard University with a degree in philosophy and literature. Before joining Yale, he worked as a teacher and as an organic farmer. About Re-Thinking Soup: Every Tuesday from 12:00-1:30 PM, the Hull-House Museum hosts a modern day soup kitchen that is a public and communal event where we gather together and eat delicious, healthy, soup and have fresh, organic conversation about many of the urgent social, cultural, economic and environmental food issues that we should be addressing. Recorded Tuesday, August 25, 2009 at Jane Addams Hull-House Museum. Grace Lee Boggs at Hull-House! Yesterday we had the most beautiful event at the museum. In honor of Jane Addams’s birthday we held our annual Conversation on Peace and Justice, and this year’s keynote speaker was none other than Grace Lee Boggs. Grace Lee Boggs just celebrated her 94th birthday, so it was a real privilege for us to hear her speak in Chicago. Bill Ayers noted how she is especially wise in her ability to take the long view when thinking of justice without giving up the “fierce urgency of now.” I was especially impressed with Grace’s perspective on struggles in history and with involvement in today’s movements. For example, she spoke of Will Allen at Growing Power and the importance of his work in looking at environmental and food access issues when an audience member asked for examples of the new revolution that Grace spoke of. Kevin Coval introduced Grace with a poem that honored her work and struggle. Grace’s speech will soon be available at Chicago Amplified.